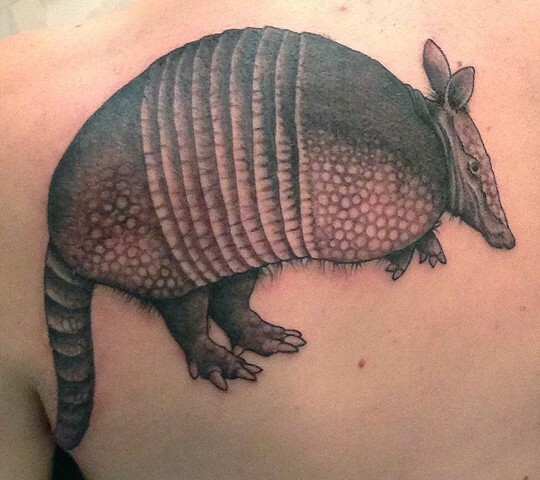 A very pleasant gal wanted a giant armadillo on her back because she said it was her spirit animal. I found the designation as SA to be a little more odd than the request to have it tattooed on her, but at this point, very few tattoo ideas surprise me. As for spirit animals, I have an ongoing list, amongst them are Tequila, the band 'The Bronx' and Rihanna's song 'Cheers'. I also really like mini donkeys and hot dogs. I do not like barnacles or anything with a lot of eyes.